In an entry several weeks back, I argued that the auditory dorsal stream may not be auditory-specific. (See "The auditory dorsal stream may not be auditory.") I previewed an experiment by a former TalkingBrains West grad student Judy Pa (now at UCSF) in which skilled pianists were asked to listen to novel melodies and either covertly hum or imagine playing the melody during fMRI scanning. What we found was that area Spt -- previously thought to be an auditory-motor integration area -- showed a reduction in amplitude during the listen-play condition relative to the listen-hum condition. An inferior parietal region showed the reverse pattern. We concluded that Spt is not auditory-motor, but sensory-vocal tract. That is, it is a sensory-motor integration area for the vocal tract that happens to receive a lot of auditory input, but could just as well receive input from other modalities (e.g., perception of visual speech, lip-reading, activates this general area). The paper describing this work is now in print in Neuropsychologia, 2008, 46:362-8. Check it out! A previous post pointed out that the available data from studies of cortical atrophy and metabolic measures do not support the idea that semantic dementia results from focal damage to the anterior temporal lobe. Caveat: for researchers interested in differentiating the pathologies associated with the various forms of frontotemporal dementia, AD, and related diseases, the ATL pathology in SD may very well be considered to be "focal" in the sense that the bulk of the atrophy and hypometabolism, at least in early stages of the disease, is in the anterior half of the temporal lobes. So if claims about the ATL being a semantic hub (or some similar concept) are willing to include in their definition of ATL a number of different anatomical structures and cytoarchitectonic fields, including both neocortex and limbic structures (hippocampus, amygdala), with posterior involvement including roughly half of the temporal lobe ventro-laterally, then I think SD can provide reasonable support for this idea. My own interest in the link between SD and the ATL came out of claims that used SD to argue that the lateral anterior temporal lobe (i.e., those regions corresponding to "sentence-specific" activations, and "intelligible speech" activations) was the projection site for the auditory/speech ventral stream, in contrast to the position David and I have put forward which argues for the posterior temporal lobe instead (e.g., see Scott & Wise and Hickok & Poeppel in the Special Issue of Cognition that David and I edited in 2004). The fact that SD has substantial MTL involvement and has ventro-lateral involvement that appears to extend quite a ways posterior, undermines the SD argument for an anterior-only auditory ventral stream. This is the sense in which I say SD pathology is not focal. Caveat aside, there are still some remaining problems with associating SD and ATL dysfunction that became clear in the readings from last week. Problem #1: Atrophy/hypometabolism is not always correlated with function. For example, SD patients have both atrophy and hypometabolism in MTL structures -- the same MTL structures implicated in episodic memory deficits in AD, Case H.M., etc. -- yet SD patients don't have significant episodic memory impairments. Nestor, et al. (2006; NeuroImage, 30:1010-20) write, "Bilateral MTL hypometabolism in SD is, however, paradoxical since this deficit ought to be associated with episodic memory impairment." p. 1013. And regarding volumetric studies they say, "...the present observation suggests that studies aiming to corrlate MRI-derived volume loss with a given neuropsychological profile are at greater risk of producing false-positive and false negative results than previously thought." p. 1017. These authors provide reasonable explanations for these paradoxes (interaction with other damaged networks, specific pathologies involved, etc. ), but the point is that these gross measures of brain structure/function are not necessarily straightforward correlates of cognitive function/dysfunction. Other examples of this same sort of problem come from comparisons of HSVE and SD, both of which have substantial ATL involvement, but with different behavioral manifestations. Levy et al. (2004, PNAS, 101:6710-15) report three cases of amnesia with rather extensive bilateral damage to medial temporal lobe structures, and compare findings from these three patients with published data from SD patients on the same tests. One case in particular, G.T., is particularly interesting in light of the extent of involvement of the ATL bilaterally: "The damage involves the anterior 7 cm [!] of the left temporal lobe, [and] the anterior 5 cm of the right temporal lobe..." p. 6711. The extent of the damage can be seen clearly in the structural MRIs below shown in radiological format (left=right). This patient should behave like an SD patient, worse even, on all the standard tests. However, G.T. 's performance was well above the standard error of the group of SD patients on tests of word recognition, picture naming, naming to description, subordinate category sorting, the Pyramids and Palm Trees test, and real/non-real object judgment. This is not to say that the patient was unimpaired on these tests relative to controls (s/he was), or that G.T. didn't have SD-like trouble on some semantic tests (e.g., category fluency for living things, yes/no questions regarding semantic features), but it is quite clear that extensive bilateral ATL+MTL damage does not produce semantic dementia. The other two amnesic patients, whose lesions did not extend so far laterally, performed very well on all these "semantic" tests, and generally better than G.T. suggesting some role for the lateral ATL in semantic abilities. But again, the question is, why are SD patients so much worse off than G.T. who had severe damage to all the "classic" SD areas? Perhaps it is the more posterior extent of the SD pathology, together with the more anterior disruption that explains the severity of the deficit. 1. Pathology in SD is not restricted to the ATL. 2. Structural and metabolic correlates of cognitive dysfunction are not definitive, and must be interpreted with extreme caution. 3. Medial ATL involvement in SD does not appear to account for semantic deficits (see Levy et al.). 4. Antero-lateral involvement of the ATL may account for some of the semantic impairment, but certainly not all. My tentative conclusion, then, is that the pathology has to interrupt function in more posterior ventro-lateral portions of the temporal lobe to produce the full blown deficits in SD. Readings for this week focus on understanding the nature of the semantic deficit in semantic dementia, starting with Elizabeth Warrington's original 1975 description. Should be an interesting set. I have more than this, but thought 7 papers was enough for a week's worth of reading. They are listed in chronological order, so subsequent readings (for next week) will be more recent. As always, please let me know of any critical omissions. Q J Exp Psychol. 1975 Nov;27(4):635-57. The selective impairment of semantic memory. Hodges JR, Bozeat S, Lambon Ralph MA, Patterson K, Spatt J. The role of conceptual knowledge in object use evidence from semantic dementia. Brain. 2000 Sep;123 ( Pt 9):1913-25. Bozeat S, Lambon Ralph MA, Patterson K, Garrard P, Hodges JR.
Non-verbal semantic impairment in semantic dementia. Lambon Ralph MA, McClelland JL, Patterson K, Galton CJ, Hodges JR.
No right to speak? The relationship between object naming and semantic impairment: neuropsychological evidence and a computational model. J Cogn Neurosci. 2001 Apr 1;13(3):341-56. Passmore MJ, Ingles JL, Fisk JD, Darvesh S.
Disconnection of language and memory in semantic dementia: a comparative and theoretical analysis. Curr Alzheimer Res. 2005 Oct;2(4):435-48. Review. "Presemantic" cognition in semantic dementia: six deficits in search of an explanation. J Cogn Neurosci. 2006 Feb;18(2):169-83. Benedet M, Patterson K, Gomez-Pastor I, Luisa Garcia de la Rocha M.
'Non-semantic' aspects of language in semantic dementia: as normal as they're said to be? The following is a "guest post" from Matt Lambon Ralph. Sounds like some cool stuff Matt. Thanks for the info! I'll respond in the "comments" box soon. Thanks for your thoughts and queries about our recent study, utilising rTMS to probe the function of the anterior temporal lobe, particularly with regard to its role in semantic memory. Of course our jumping off point with this line of investigation was the neuropsychological studies of semantic dementia (SD) that a number of groups, including our own, have conducted. While the exact interpretation of the SD patients is a topic of current debate (see other blog entries here, Alex Martin’s 2007 Annual Review of Psychology, Karalyn Patterson et al’s NRN paper), the simplest explanation is that damage to the ATL leads to a specific semantic impairment – by which I mean one that affects any task that requires or involves semantic memory (in reception and expressive, verbal and nonverbal domains) but not other aspects of language, perception, problem-solving, etc. The selective nature of their impairment is really striking clinically as well as in formal testing. However, given the debate about the location of damage in SD – we have embarked upon a series of rTMS studies to provide converging evidence for what the SD data seem to be indicating. To license direct comparisons we have, wherever possible, tried to utilise the same tasks and test materials that we use in SD patients but in normal participants (collecting both RT and accuracy). A quick summary of our findings: 10 mins of 1Hz rTMS over the left temporal pole significantly slowed synonym judgement times, slowed naming at the subordinate level (“Dalmatian”) but did not affect two “control” tasks (number judgement and number naming tasks – each of which was harder than the respective semantic tasks in terms of baseline reaction times – in order to rule out any findings being due to general difficulty). Basic level naming also slowed numerically but this change was not statistically significant. This pattern of findings is pretty much what one would expect from an SD perspective – as noted above, they exhibit receptive difficulties (they are impaired on the same synonym task) and expressive impairments (they are profoundly anomic) but not other taxing, non-semantic tasks. Indeed they tend to be rather good at number judgements (involving quantity judgements). 1. Control task vs. control area: the most common form of control method in TMS studies is the “control site” method – i.e. stimulate a site of non-interest to ensure that same results do not following from any form of non-specific brain stimulation. This is quite useful if one is trying to demonstrate that a new specific region (e.g., one that is identified in an imaging study) is required in a task. For our study, however, the motivation and research question was a bit different to the standard one underpinning most rTMS experiments. 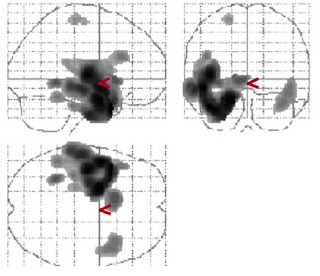 Given the SD data – we were specifically interested in probing the function of the ATL itself in normal participants: i.e., if we stimulate the same region that is maximally damaged in SD does it produce the same neuropsychological pattern as the patient? If the ATL atrophy in SD is a “red herring” - i.e., is not responsible for their semantic impairment then stimulating this same region in normal participants would not be expected to have any semantic effects. (Of course we are interested in which other brain regions are, and are not involved in semantic cognition but that is another story.) Because we were interesting in how closely ATL rTMS would mimic SD, we adopted the less common “control task” method. The “logic” of this is not that dissimilar to the idea of subtractions in neuroimaging – find a pair or selection of tasks, matched for general levels of difficult, which differ in terms of the representations/process of interest. We alighted upon numbers because we know SD patients tend to be good at them and also we were able to fashion a task in which the RTs were slower than the semantic tasks. By picking number judgement and number naming as two control tasks we mirrored the receptive and expressive aspects of the two semantic tasks. By gradually building up the range of semantic and control tasks used across studies, we should be able to construct a rather comprehensive picture of which aspects of cognitive behaviour involve this region. Of course, it is possible that some of you may not be that interested in mimicking SD data as we were and consequently would like to see a control site as well. I’m pleased to say, therefore, that we have applied the “belt-and-braces” approach to more recent experiments by including both types of control method as well as other types of control tasks – and the findings are unchanged: ATL rTMS slows semantic tasks but not number or visual matching tests, whereas stimulation to a non-ATL site does not affect any of these tasks. 2. As Greg rightly points out, the results from SD (e.g., Bozeat et al., 2000, Neuropsychologia) suggest that the ATL is the basis for amodal semantic representations. Accordingly, we would really expect to see slowing on nonverbal as well as verbal semantic tasks after ATL stimulation. He suggests using a task like the Pyramids and Palm Trees Test (in which semantic associative knowledge is probed either with picture or word materials), which we commonly use in patient testing. As it happens, this is exactly the study we have just completed – and the results are just as predicted: rTMS to the ATL slows this task in both its verbal and its picture-based versions, and to the same degree. So by combining the data from our published study with these new results, we can mirror the combination of problems observed in SD – i.e., the ATL seems to be involved in expressive and receptive semantic tasks for verbal and nonverbal domains. This is, of course, consistent with the idea that this region develops amodal representations that combine with information in other modality-specific regions to support semantic processing (Rogers et al, 2004, Psych Review). This week we read over a bunch of papers looking at the distribution of atrophy and metabolic changes in semantic dementia, as well as correlation of these measures with semantic and naming tasks. Our goal was to determine whether the semantic deficits in this syndrome can be linked to ATL dysfunction, as some have claimed. As Patterson et al. (2007, NRN, 8:976-88) put it, the strength of this view "...hinges, however, on claims about the relatively focal nature of the pathology in SD." p. 980. Grossman et al (2004, Brain, 127:628-49) reports that, "...significant grey matter atrophy was evident in several areas of the left emporal cortex in SD." p. 635. These included (from Table 4, p. 637), Left ventral temporal, Left anterior temporal, Left posterolateral temporal, & Left parahippocampal. Grossman et al. (2004, same as above) report significant correlation between naming performance and grey matter atrophy in two left ventral temporal sites (one quite posterior involving BA 19/37), right posterolateral temporal, and bilateral occipital. And Galton et al. (2001, same as above) report correlations between semantic tasks and volume measurements in the left fusiform. Conclusion: data from semantic dementia does not conclusively implicate the ATL, unless by "ATL" one is willing to include minimally (e.g., see Nestor et al. 2006, NeuroImage, 30:1010-20 for the most "focal" results of all the papers we've read), limbic structures in the medial temporal lobe (hippocampus and surrounding cortices), and ventro-lateral temporal lobe structures extending (on the left) posteriorly to include about half the entire temporal lobe. There is a Special Issue of the Philosophical Transactions of the Royal Society that is now available on their web site. The issue was edited by Brian Moore, Lorraine Tyler, and William Marslen-Wilson. Volume 363, Number 1493 / March 12, 2008 of Philosophical Transactions of the Royal Society B: Biological Sciences is now available on the journals.royalsociety.org website at http://journals.royalsociety.org/content/g8qw148t1113/. Patricia K. Kuhl, Barbara T. Conboy, Sharon Coffey-Corina, et al. While our terminology changes slightly -- reflecting the fact that we don't really know what's being computed -- we have been very clear that this is not a model of semantic memory/conceptual knowledge organization, but rather a claim about the area that is particularly important for interfacing such information (located elsewhere) with acoustic/phonological representations of speech. "In contrast to other authors who suggest that semantics is represented in meaning-specific brain regions that process all words alike (Hickok and Poeppel, 2000; Lichtheim, 1885; Price et al., 2001; Scott and Johnsrude, 2003; Wernicke, 1874), we proposed that semantic representations are distributed in a systematic way throughout the entire brain." Hauk, et al., 2004, p. 305. "The concept of the word 'bell', for example, is formed by the associated memory images of visual, tactual and auditory perception. These memory images represent the essential characteristic features of the object, bell." "... the memory images of a bell ... are deposited in the cortex and located according to the sensory organs." 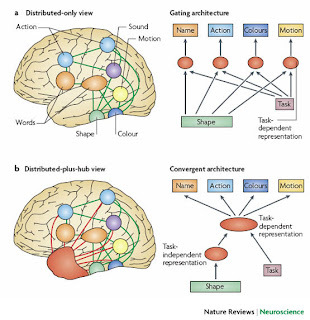 For details on Wernicke's rather sophisticated distributed theory of conceptual representation of the brain, including a new translation into English of a paper by Wernicke on the topic, see Gage & Hickok, 2005. Seriously, check it out -- you will be surprised to learn that Wernicke even postulated "Hebbian learning" mechanisms decades before Hebb. "Though in the diagram B is represented as a sort of centre for the elaboration of concepts, this has been done for simplicity's sake; with most writers, I do not consider the function to be localised in one spot of the brain, but rather to result from the combined action of the whole sensorial sphere." The point here is not so much to criticize anyone for misquoting -- it is easy to misquote, and I'm sure we are all guilty -- rather the point is (i) to make it perfectly clear what David and I are actually claiming w.r.t. semantics because I think some people are missing the distinction between a semantic memory system and an interface between this system and speech, and more importantly, (ii) to (re-)emphasize that when you are talking about "semantics", be very clear regarding what part of semantics you're talking about. 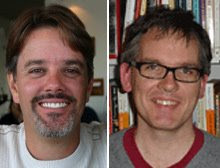 Gage, N., & Hickok, G. (2005). Multiregional Cell Assemblies, Temporal Binding, and the Representation of Conceptual Knowledge in Cortex: A Modern Theory by a "Classical" Neurologist, Carl Wernicke. Cortex, 41, 823-832. Hauk, O., Johnsrude, I., & Pulvermuller, F. (1994). Somatotopic representation of action words in human motor and premotor cortex. Neuron, 41, 301-307. Hickok, G., & Poeppel, D. (2007). The cortical organization of speech processing. Nat Rev Neurosci, 8(5), 393-402. Lichtheim, L. (1885). On aphasia. Brain, 7, 433-484. Pobric, G., Jefferies, E., & Lambon Ralph, M.A. (2007). Anterior temporal lobes mediate semantic representation: Mimicking semantic dementia by using rTMS in normal participants. PNAS, 104:20137-41. Wernicke, C. (1874/1977). Der aphasische symptomencomplex: Eine psychologische studie auf anatomischer basis. In G. H. Eggert (Ed. ), Wernicke's works on aphasia: A sourcebook and review (pp. 91-145). The Hague: Mouton. Wernicke, C. (1885-1886/1977). Einige neuere Arbeiten ueber Aphasie. In G. H. Eggert (Ed. ), Wernicke’s works on aphasia: A sourcebook and review. The Hague: Mouton. Having determined that semantics is complicated, our next topic is semantic dementia, a syndrome in which "semantic knowledge" is thought to be disrupted. There are a TON of papers on semantic dementia. For this week, we're going to start, somewhat arbitrarily, with the papers listed below. If anyone has any suggestions regarding critical papers that we can't afford to miss, please post a comment. Patterson K, Nestor PJ, Rogers TT. Nat Rev Neurosci. 2007 Dec;8(12):976-87. Review. Semantic dementia: a unique clinicopathological syndrome. Lancet Neurol. 2007 Nov;6(11):1004-14. Review. Pobric G, Jefferies E, Ralph MA. dementia by using rTMS in normal participants. Proc Natl Acad Sci U S A. 2007 Dec 11;104(50):20137-41. Epub 2007 Dec 3.
virus encephalitis and semantic dementia. Brain. 2007 Apr;130(Pt 4):1138-47. Epub 2007 Jan 24.
la Sayette V, Belliard S, Eustache F.
Neurobiol Aging. 2007 Dec;28(12):1904-13. Epub 2006 Sep 15.